hihi... he's a looker this one! beautiful linework on the background! I hope the good days become standard soon for your father. ohh love this! The dino is way cute and the finish with the sepia and the white looks awesome! I agree love the sepia and the dino is very cute. I enlarged your image in order to look at the great lines. My favourite colours. Nice job on the dinosaur. Fun expression. I like the crazy eyes. Good luck with your dad's recovery. Awesome dino! The white(out?) really brings out the character. 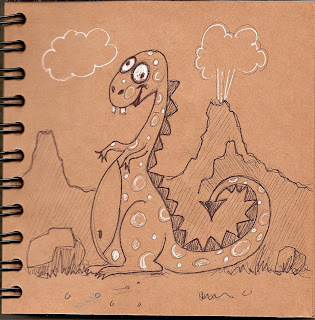 It looks like your dino might have just got wonked on the noggin by one of those rocks, which perhaps were launched by the groovy volcano a ways off in the distance. Love this. Hello Jo, thanks for visiting my blog and commenting. Your work is very sweet and fun. Great job. What a great character. What did you use for the white?